Thyroid disorders are getting increasingly common in today’s world. Thyroid disorders need regular treatment, but, apart from medications, certain yoga postures have proven to be beneficial in reducing hypothyroidism. 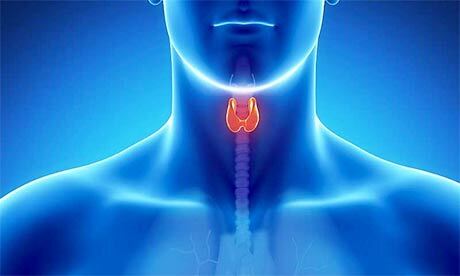 Thyroid is a small gland located in the throat region, which is vital in secreting hormones that are responsible for body’s metabolism, growth and in maintenance of temperature. Basically, the thyroid disorders are of two types – Hypothyroidism and Hyperthyroidism. Hypothyroidism can happen when the thyroid gland fails to produce sufficient thyroid hormones, while hyperthyroidism can occur when the thyroid gland releases too much of hormones. Yogasanas were considered an effective natural remedy for dealing with thyroid disorders. Although, it may it may not be an instant cure to the condition, it can go a long way in keeping the glands healthy and help in regulating metabolism, preventing further complications. A recent study confirmed that 6 months of intense yoga practice helped women with hypothyroidism, reducing their dependency on thyroid medication. Here are few yoga postures that can be effective in reducing hypothyroidism. They strengthen muscles and reduce effects of hypothyroidism on the body. This asana is so-called, as it is the legs up the wall pose. It is beneficial in improving blood circulation to the thyroid gland. It regulates the overall functioning of thyroid gland, and has a rejuvenating effect on the mind too. Apart from relieving stress, fighting anxiety and curing insomnia, this posture is beneficial in numerous other ailments too. This posture helps in maintaining the balance of the whole endocrine system. This posture exerts pressure on the thyroid gland, offering it good supply of blood. It squeezes stagnant secretion and improves blood circulation to all parts of the body, and is particularly beneficial in functioning of neck and thyroid gland, and reverses hypothyroidism. This posture can stimulate the thyroid gland by stretching the neck and increasing blood circulation in the gland. This yoga posture, apart from offering relief from thyroid problems, can also help you in relieving issues related to the spine. It helps people suffering from asthma. But, this posture should be avoided in case you have ulcers or hernia. People suffering from abdominal injuries, arthritis and vertigo should avoid doing this posture. The bridge pose is highly beneficial in offering relief from hypothyroidism. This is because this posture particularly stretches the neck and improves blood flow into the thyroid gland. It also reduces headaches, strengthens muscles, and treats asthma. Women in their advanced pregnancies should avoid this posture. This is another posture that helps stretch the neck and stimulates thyroid glands. But, this posture should not be performed if you are suffering from hyperthyroidism, as it helps in secretion of thyroid hormones. Therefore, it is only helpful if you suffer from hypothyroidism. Apart from this, this posture strengthens abdominal muscles, and relaxes autonomous nervous system. The back arch performed during this posture helps increase blood circulation in the thyroid gland. This pose stretches the neck, throat and stimulates thyroid gland, thereby relieving any tension in that area. As this posture is done by inverting the head, blood flow to the thyroid gland is improved and hence this is a good posture for you if you suffer from hypothyroidism. This posture also helps in maintenance of healthy abdominal muscles and spinal column. This yoga posture helps in thyroid massage, which compels the gland to produce the required amount of thyroid hormone for controlling metabolism, thus making this an effective posture for treating hypothyroidism. This pose helps in strengthening of back, relieves menstrual pain and relieves stress levels too. This pose forms a part of Suryanamaskar, and it stretches the neck and throat region, increasing thyroid functioning. It is beneficial for people suffering from hypothyroidism, back or neck pain. It also helps in strengthening and toning of muscles. In case you have recently undergone an abdominal surgery, or have hernia, or ulcers, you should avoid this pose.